Dr. James Zais arrived in Washington in 1973. "If I were only a gay candidate, I wouldn't even get many votes in the gay community. I believe we need a gay advocate on the council, but gay voters are like anyone else. They want stands on neighborhood issues." "Marion Barry made a lot of mistakes. Hiring me was not one of them." 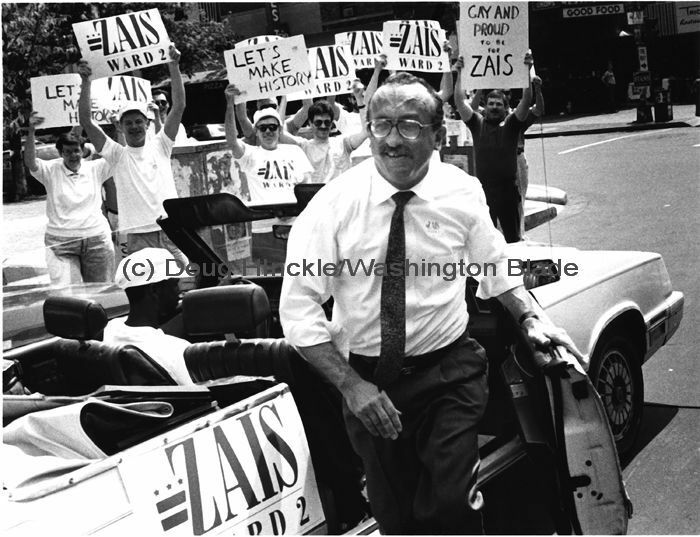 For over two decades, Dr. James Zais, better known as Jim Zais, was at the center of gay civil rights issues as well as local and Democratic Party politics. As a gay activist he led many of the city’s key gay political organizations and played a central role in creating the gay community’s often pivotal role in local issues and politics. As an urban planner, he wrote on and frequently led discussion and resolution of community development, housing and income maintenance issues. Fittingly for a man whose doctorate lay in political science and urban policy, Jim Zais early engaged himself in the gay civil rights struggle. At the outset of the 1970s In Buffalo, NY, where he was an assistant professor of political science at SUNY Buffalo, he joined and within a short time led the city’s first gay civil rights organization, the Mattachine Society of the Niagara Frontier. It was in Buffalo’s gay civil rights circles that Jim Zais and Don Michaels (first full time employee of The Blade) first became acquainted. Moving to Washington, DC in 1973 to take a research position at the Urban Institute, Jim Zais joined local gay political organizations, among them the Gay Activists Alliance (GAA) and the Gertrude Stein Democratic Club. In the mid-1970s, he actively involved himself in the campaign to eliminate the police department’s vice squad by eliminating its funding from the city budget. Jim became president of GAA in the midst of the nationwide Bryant campaign to roll back protections for the LGBT community. During his term (1976 – 1977), GAA succeeded in prohibiting consideration of sexual orientation in child custody and visitation cases. GAA also pressed for re-enactment of Title 34, the pre-home rule human rights act, under the DC code to prevent any attempts at rolling back gay civil rights. Under Jim’s leadership, GAA’s Project Awareness brought public service announcements that discrimination against gays is illegal in the District to public radio stations. Jim Zais was one of the influx of lesbian and gay individuals appointed to DC government positions in the first years of Mayor Barry’s administration. From 1983 until 1991, he served as the mayor’s coordinator of constituent services and liaison to Ward 2. His years serving Ward 2 constituents gave him a solid grounding in local affairs. During that time, he also pushed for greater awareness of the toll that AIDS was taking in the African-American community noting in a 1988 interview that "There's a mistaken perception that the only people with AIDS in the black community are babies and IV drug users, which is clearly not the case.” He pushed as well for city funding of AIDS drugs for those who could not afford them. Jim’s most public role in advancing the notion that gays and lesbians could function without narrow self-interest on citizens’ behalf came in his 1991 campaign for the Ward 2 DC Council seat vacated by John Wilson when he became Council Chair. In a hard fought campaign against Jack Evans, Zais campaigned as a candidate with insight and ability on local constituent issues rather than as a gay candidate. Late in his campaign a series of homophobic statements by a Shaw civic activist undermined his appeal among African-American voters. He lost to Evans by just over 300 votes. The campaign was the closest the gay community had come to joining the city’s legislative body in twenty years of activism. Following the election, Jim Zais joined the Washington Urban League as a program development director and helped the League raise nearly $3 million for projects. In 1992, Jim supported Evans’ run for a full term on the city council. Following his death from AIDS-related complications in 1994, a crowd of gay activists, civic leaders, and city officials packed a memorial service at the Friends Meeting on Florida Avenue and Decatur Place.